The Pacific Plate is the largest of the 7 major tectonic boundaries. With a size of 102,900,000 km2, it more than doubles the size of the South American Plate. Plate tectonics are odd because they often consist of oceanic and continental crust. For example, the Pacific Plate underlies the Pacific Ocean and positioned smack dab in middle are the Hawaiian islands. The Pacific Plate stretches all the way along the west coast of North America up to Alaska. At the western edge, it reaches all the way to the east coast of the islands of Japan and Indonesia. This plate forms a large portion of the Pacific Ring of Fire. This horse-shoe looking pattern of plate tectonics has some of the most catastrophic earthquakes and volcanoes on Earth. 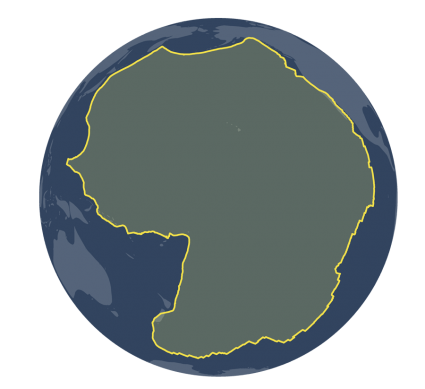 On average, the Pacific Plate moves at a rate of 5 to 10 centimeters per year. However, the Pacific Plate, Cocos Plate, Nazca Plate and Antarctic Plate move more than 10 centimeters which is the fastest movement rate of all plate tectonics. The Pacific Plate contains all the plate tectonic boundary types along its boundary. 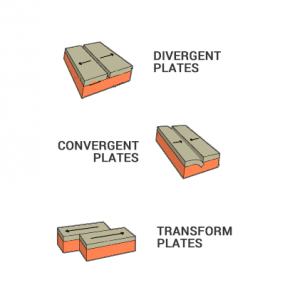 In other words, it shares convergent, divergent and transform borders with other plates. The southern edge is a divergent plate boundary with the Antarctic Plate. As these two plates pull apart from each other, it forms new oceanic crust. Already mentioned, the The Pacific Ring of Fire has the most active chains of volcanoes in the world. This is because tectonic plates collide and sink at these zones of subduction (convergent plate boundaries). Lastly, the San Andreas fault is between the North American Plate and Pacific Plate are transform plate boundaries. While the North American plate in the east moves in the southwest direction, the Pacific plate in the west moves northwest. The Hawaiian islands are positioned at the center of the Pacific Plate. But it’s an interior hot spot within the Pacific Plate that is responsible for the volcanic activity that occurs here. Think you know plate tectonics? If you lived in Hawaii, you’d be situated smack dab in the middle of the Pacific major plate. But what if you lived in Africa or North America? What are some of the other plates in the world? 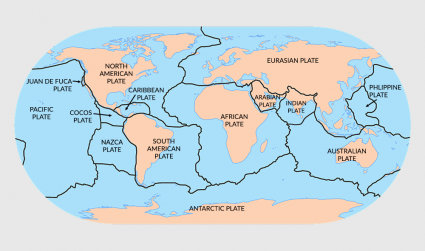 Get familiar with the plate tectonic jigsaw puzzle by reading some of the articles below. The Pacific Ring of Fire has the most active chains of volcanoes in the world. This is because tectonic plates collide and sink at these zones of subduction. Per what unit of time? It’s per year. I fixed the text. Thanks!